And it has playable Sanae! Unlike the usual, I’ve made some pretty big balancing changes to the scoring system; it should be pretty challenging. I’ve paid close attention* to the difficulty level. It should be pretty easy on Easy(?). It doesn’t have a very serious feeling. With Sanae added, there are now three playable characters. Each of them choose one of two objectives and go chasing after the ship at top speed. The surprisingly non-serious objectives will… but anyway. The release is planned for 2009 summer. The demo is planned for Reitaisai on March 8th. After you’re tired of the demo you can use it as a nabe stand. The demo will have three stages, as always. Actually the entire game will be “as always”, as always. No matter how old it gets, it still remembers the old days. edit: Apparently I can translate but can’t spell the English title. It’s now up to “Shin Mazinger Shougeki! Z Hen on televison” and hopefully will stay that way. The bit of art on the website looks great, being 70s and modern while not being all 2000s and round-looking. There’s something wrong with Sayaka, though. I noticed that all the voice actors were completely new people, except for one – the narrator Genda Tesshou, aka the narrator from Ippatsu Kikimusume and, apparently, Japanese Batman. Normally I’d be worried about that, but Imagawa does no wrong. On a completely unrelated note I like this video. Also no baseball has actually happened in the first 5 manga chapters, but the girls did say “gokigenyou” a lot, and that’s what counts. 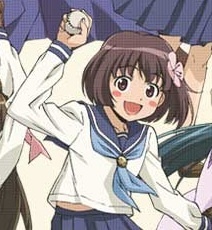 I think the manga artist might be adapting something else and trying to justify its plot holes – the backgrounds and stuff seem pretty period-accurate, but in chapter 3 the first girl up there invents aluminum baseball bats(!?!). 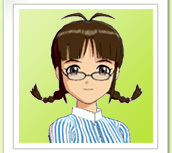 Translator/blogger’s Introduction: I’ve started reading more Japanese blogs as of late so that I don’t have to rely on slanted, NWS English-language rss feeds for nerd news. Some of the aggregators I started keeping an eye out on link to regular folks’ blog posts, which led me to Tamagomagogohan, a blog run by Tamagomago-san. (ironically, link may be nws, especially if you live in Canada or Australia.) 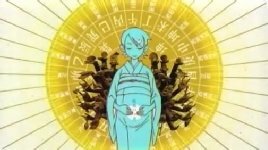 I found this wonderful post by Tamagomago-san on the Sayonara Zetsubou Sensei OPs on Friday, and was kindly given permission from him to post a translation of it here. I have to warn you that this may require some more reader participation to follow his argument than the average English-language blog post, but that’s just how Japanese essays seem to be. There are translator’s notes interspersed throughout the article. The author also frequently uses the technique of putting the characters for an idea or concept in quotes, which works out a lot cooler in Japanese than it does in English. For this reason, I’ve included the original Japanese characters in addition to my translation where I felt it would be enlightening to those familiar with moon runes. I hope you enjoy! Please don’t hesitate to comment if you’d like to offer any suggestions or would like any sort of attempt at clarification. 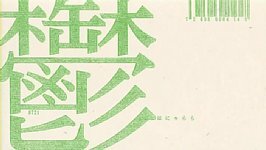 Finally, I’d like to once again suggest you take a look at the author’s blog if you can make sense of Japanese and are interested in a good read. 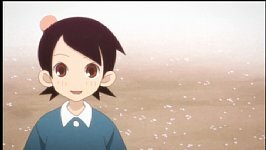 The final episode of [Goku] Sayonara Zetsubou Sensei has been released. That’s it for the OADs. Hmph, so sad :(. I’m hoping for a third TV season. Well, I’d like to start with a little review of OPs until now. 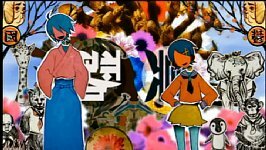 Shoujo Objectification and Dismantling as Seen in the Sayonara Zetsubou Sensei OP. 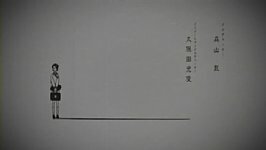 The OP song is “Hito Toshite Jiku ga Bureteiru”. It’s an intense OP where the show’s girls are erotically both dismantled and bound. As one goes deeper and deeper into a world overflowing with eros, they turn to more and more extreme paths in that world. Despite the incredible sense of lust, Sensei’s heart is being eaten away by depression. This is a mysterious scene, profound yet unexplained. Next we have the second season, [Zoku]. Unlike the first OP, this one started out in monochrome. 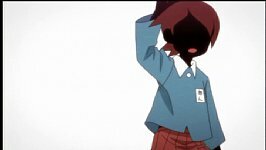 This OP had the special trait of changing throughout the different episodes, cutting off midway in some versions and finally appearing in full color, surprising quite a few people. The theme of this OP is “Mania” (躁), acting as a pair to the first season’s theme. It’s all extremely high-tension, wouldn’t you say? Despite the OP’s colors being in plain monochrome, its actual content is so excited that you feel like you’re about to go mad. Once color is added to all of this, a new, vibrant world is born. 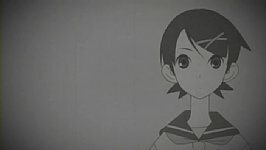 That girl is the girl who we saw in season 1 pregnant with Zetsubou-sensei’s children, Fuura Kafuka (Pen Name). Next, the [Goku] OVA series. Now things are at the point where you can’t even figure out what’s going on. While it was called “A Professional MAD”, we can see a complete lack of living characters here, the girls instead fully turned to objects. Via “Depression”　(鬱), we fall into the confusion of “Mania”(躁), and also into “Chaos” (混沌). Feeling a sense of raw “Eros” and gazing at “Grotesque” death, we come to an underlying “Objectification” (物体化). While wriggling between the boundary of “Truth” (真実) and “Pretense” (虚像), their form changes shape and color. While each of these views are incredibly symbolic and interesting possibilities, we discover from whose perspective these openings are all from in the final part of [Goku]. You’ve probably guessed by now. It’s Fuura Kafuka. The reason this world is constantly changing is because of this girl’s inner fragility and instability. Ambivalence Seen by the Girls’ Eye(s). The music this time is an arrangement by “Rapbito”. While that may be surprising, there doesn’t remain a trace of the previous OPs’ sense of parody. Instead, they’ve created an entirely new work. It’s almost as if it’s a MAD created by Gekidan Inukaree (note: Gekidan Inukaree, literally “Dog Curry Troupe,” is the individual/group responsible for the OP). This OP is quite obsessed with certain details, one of which being that if you look closely in the corners of the frame, you can see characters representing the two sides of each girl. 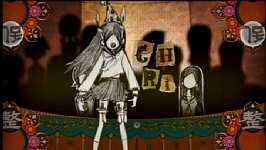 Chiri is “Chaos” (乱)and “Order” (整). 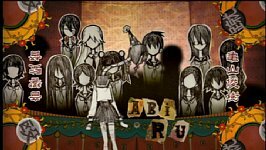 Abiru is “Kick”　(蹴) and “Punch” (殴). There’s also “Good” (善) and “Evil” (悪), “Victim” （加) and “Aggressor” （被), “Seme” （攻) and “Uke” （受), “Poverty” （貧) and “Wealth” (富), and so on. 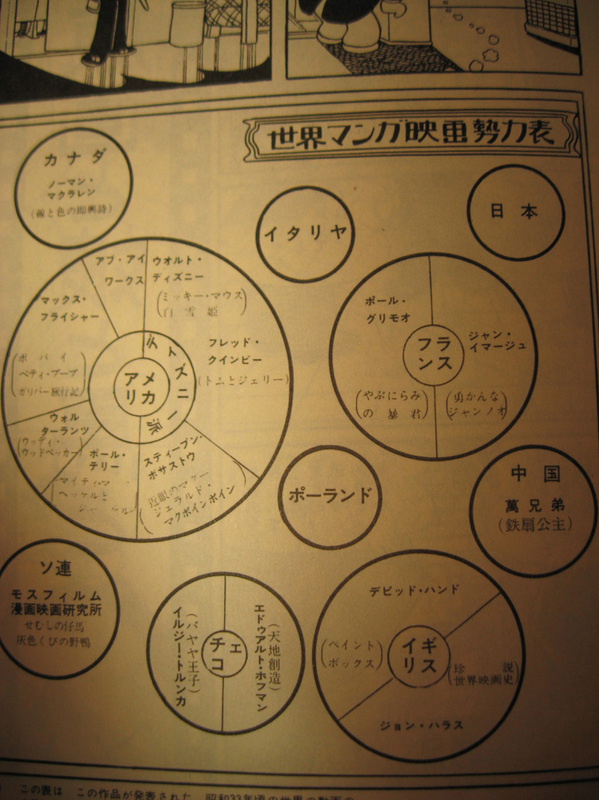 Each girl’s “Existence-as-Presented” (イメージの存在) is made up of two contradictory ideas. This dangerous tightrope act is at once fascinating and terrifying. 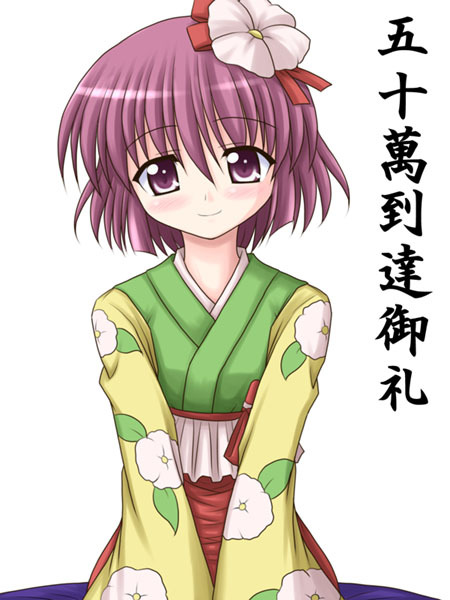 So, what about Fuura Kafuka, the girl in question? “Mania” (躁) and “Depression” （鬱). In other words, the OPs until now (Season 1: Depression, Season 2: Mania) have been expressions of the core of her inner world. 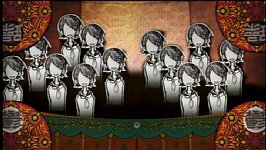 As you probably noticed by comparing this picture to the previous two, this image of the audience being nothing but Kafukas is once again symbolic, while also eerie. Fuura Kafuka isn’t her real name. It’s a pen name. 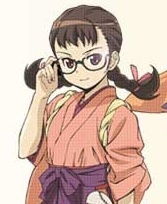 While we don’t officially know her name as of now, we see glimpse of it as “something like *this*”. However, it’s never confirmed. We even see a glimpse of this in today’s episode. Of course, this doesn’t really go beyond another guess. While our main character, the Sensei, has relatively few mysteries surrounding him, Fuura Kafuka is nothing but mysteries. Let’s take a look into such a girl’s state of mind. The sorrowful psychedelic as seen by the girl’s eye(s). Halfway through the song, the scenes introducing the girls one-by-one end, and the OP shifts to Kafuka and Sensei’s duet performance. Well, since we might be seeing a story created by Kafuka’s psyche, we might technically call it a solo performance. 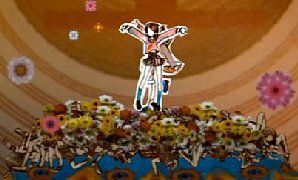 For example, the image of Kafuka dancing madly on a flower bed. She’s actually dancing on top of the rubble of her classmates’ bodies. Though, these aren’t really “corpses”. The reason I say this is because the girls in the [Goku] series up to this point have already been objectified and dismantled. 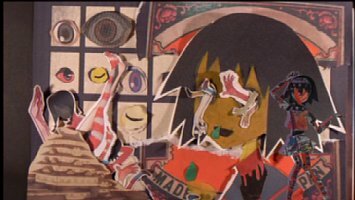 If we were to see blood or organs spilled, this could be said to represent death, but since this MAD uses the technique of “Destroying the image”, the “Girls’ Image” is replaced with lifeless objects. Hence the girls’ world is an extremely inorganic one, one where the senses are fuzzy. The scene with Sensei and Kafuka looks like this. While Sensei has been turned to an image, barely resembling any sort of living being, Kafuka herself is also turned to a strange creature. Nonetheless, if we look closely, the flowers here are, interestingly, “raw” ones. 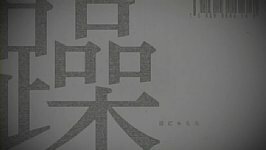 In the background we see “Falsehood” (嘘) and “Truth” (真). Once again, there’s a sense of ambivalence. When one holds ambivalence like this, one is forced to choose to either struggle against it, or become an empty shell of a human being. 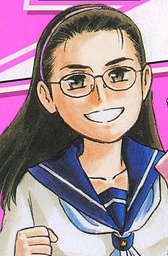 It seems as though Kafuka’s displayed positive attitude may be a result of her attempts to escape her own extreme thoughts of despair and uncertainty, replacing them with the ideas “all is inorganic” and “all is meaningless”. Of course, this interpretation is reliant on these OPs which are in some sense “professionally made derivative works”, so its relevance to the work as a whole might be questionable, but the world we’ve seen up until now is full of contradictions. In order to stay alive in this world, one can’t choose A or B, but must simply float in between the two. 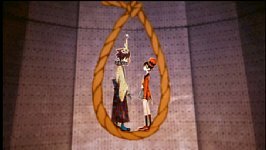 That the normally-hanged Sensei’s neck is nooseless this time, and that Kafuka is the one hanging seems especially symbolic. 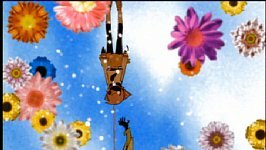 Also, the fact that the previously inorganic images in the OP are replaced with more and more live flowers also interests me. Perhaps the inorganic paper-mache world is trying to break through the wave of “Depression” and “Mania” in order to then revive itself? I just can’t figure out what color Kafuka’s world, the world illustrated by these OPs, is. Revisiting the Zoku OP with “Fuura Kafuka’s Point of View” in mind, he gradual fading followed by sudden jump into color in the final episodes seems to also make sense. 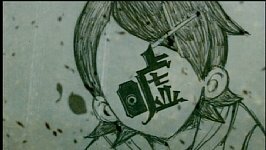 On the other hand, we could also see this as “Fuura Kafuka as seen by Sensei.” In that case, we’d have to understand the OP in a totally different way, but there is that shot in the part 3 OP where we see Kafuka with her eyes downcast, possibly crying. I think the key to figuring this all out is Kafuka’s attempt to objectify the world while Sensei tries to protect the flowers, which symbolize life. If you’re some kind of nerd who goes to anime conventions, and you’re in the Southeast, you’ve probably seen a bad anime panel run by Daryl or a poser. They’re full of high quality insane sexist gekiga/action OVAs full of peoples’ heads exploding all over the place. 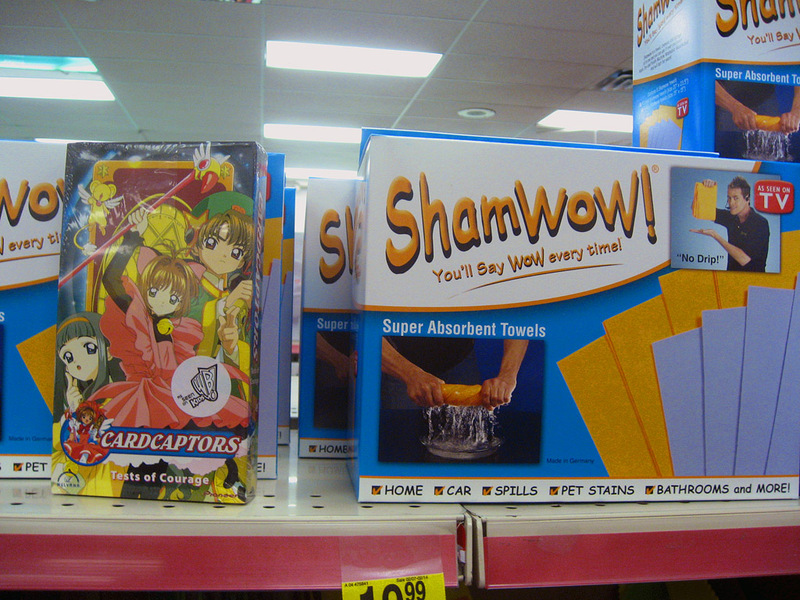 But is that really the only genre of terrible anime? There are a few others I’ve seen – I guess Gundoh Musashi is shounen or something, and Valanoir is a moé game adaptation – but they’re all male oriented. What are the terrible girls’ shows I can show at panels? Someone enlighten me. UPDATE: I forgot nobody else has seen Valanoir. It’s so good it doesn’t even have an ANN encyclopedia entry! Nichijou, arawi keiichi. Kadokawa/Shonen Ace/Comptiq. Vol 4 published 1/26/2009. I’ve been following this one on the blog for a while, and while I really liked volumes 1 and 3, 2 wasn’t that hot and 4 isn’t as exceptional as 1/3, I have to say. keiichi still has absolute top notch gag manga chops (layout/framing/timing, etc), but a lot of the best material/neta were continuations of earlier gags like the Soccer Go club and the daifuku mascot mask. I also have to warn the sensitive that there is a “what’s the deal with the crazy size names at Starbucks” chapter in here, though keiichi’s ability to draw incredible character reactions paired with his sense of timing and tempo still made me laugh at a topic that is basically comic suicide in the states at this point. Longer stories really seem to be his forte, seeing as I don’t know if I’ve laughed at one of the professor/Nano 4koma strips yet. Still in my personal list of favorite gag manga, but maybe that’s because most of the rest of the list is Bonobono. Mozuya-san Gyakujou Suru, Shinofusa Rokurou. Kodansha/Afternoon. Vol 2 published 1/23/2009. Moetan, illust. POP. Sansai Books. Vol 1 published 6/1/2006. This was given to me as a birthday present from a fellow internet illuminatus who I met last semester, so I haven’t actually had the opportunity to read volumes 1 or 2, or watch the anime, so I’m not exactly an expert on lolicon English manuals. That said, this is a hilarious lolicon English manual. A little over half of the book is ostensibly an attempt to teach English to Japanese nerds through sentences and examples that they use in their daily lives! Thus, the example sentences are mostly nerd jokes (You said you don’t like crowds. But somehow you casually endure the crowd in Comiket. / She doesn’t recognize the existence of girls who dislike homosexuals.) and there are also some conversation examples, one that’s nothing but tsundere lines, and another that’s a conversation between an American and Japanese otaku in Japan. ( That’s the coolest thing ever! The maids out front of the station waiting to greet you! Let’s go into one of those places! Hey Sam, look at this picture of the dolphin! Is this also one of the “Moe”? 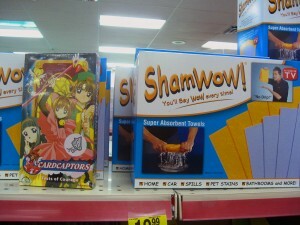 Wow, Akihabara is really a cool place! ), and so on. 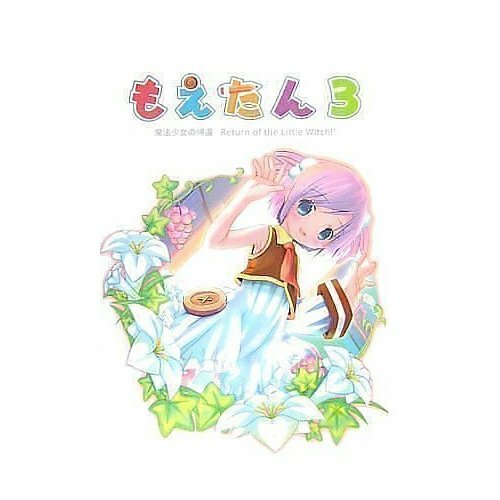 In between language examples is a story about Nijihara(虹原, o hoh hoh hoh) Inku’s attempts to bring her friend back from his secluded otaku world by shattering all of his silly nerd dreams and illusions by doing things such as showing him what the person who plays the cute female character in the dream-world MMO he’s addicted to really looks like, or calling the police on him for the books he’s selling at his dream-world Comiket shutter booth. (There’s a certain sense of hypocrisy in that one when you realize that POP illustrated this thing, but never mind that). Of course, the sentences all appear to be J->E translations, so I imagine that this would actually be more helpful as any sort of learning tool to an English speaker at an intermediate level of Japanese language experience than to a Japanese person trying to learn natural-sounding English. Either way, don’t take it so serious. 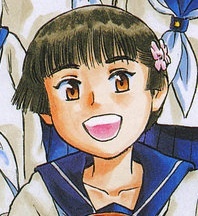 Obaachan ga Shitai Kusai Yo, Shintaro Kago. Kubo Shoten. Published 2/1/2009. 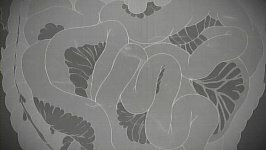 Itsumo no Hanashi, Akino Kondoh. Seirinkogeisha. Published 9/25/2008. I really should do a longer article on this since there’s a lot of blog buzz about the upcoming Ax anthology, which I believe Kondoh is doing the cover art for, but I really need to get to doing my homework, sorry! I first became interested in Kondoh after getting hooked on Nicovideo classic Densha Kamo Shirenai a while back (look at how low that sm number is! ), but didn’t give Kondoh’s other works a whole lot more thought until this magically appeared in front of my face when I was looking around at Taco Che over the holidays. 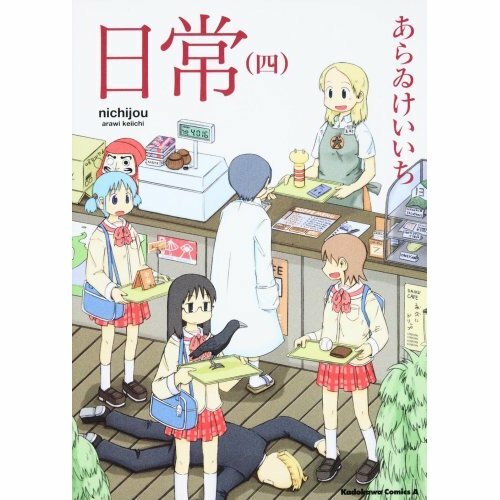 Itsumo no Hanashi is a collection of shorts from about the last decade by Kondoh, which range from somewhat light-hearted slice of life-ish stories about getting letters from old classmates (Itsumo no Hanashi) to seemingly drug-induced dream stories about talking to your legs and furniture (Kotatsu no Mawari de). Kondoh’s style is whimsical yet mysterious, but at the same time her art can get intensely unsettling and destabilizing. In terms of storytelling and overall effect, Kondoh reminds me a lot of Nekojiru at her best, using a very accessible style to get at some normally unaccessible feelings. Looking forward very much to getting her other collection as well as the English version of Ax (more info here, also here) once I get it through my head that buying one 1300y volume of absolutely beautiful manga is better than buying 13 volumes of fist of the north star at Book-Off. Well okay, maybe they’re about tied, but I ought to keep a good balance. I wrote my last batch of manga reviews the night after starting my new WoW account, so I figured it’d only be appropriate to do a new batch now that I’m 80! Also, probably going to split these up for more post quantity. 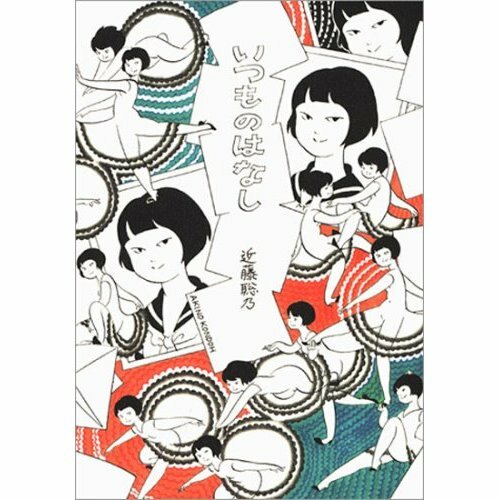 Film wa Ikiteiru, Osamu Tezuka, 1958-1959　1 vol comp, 130pgs. Serialized in Chuugaku 1nen Course/2nen Course. This is the story of two animators during the period of the dawn of animation films. Two boys named Musashi and Kojiro, respectively, who were very fond of drawing cartoons, left the countryside and journeyed to Tokyo where they eventually became cartoonists. But the dream of Musashi and Kojiro was to create animated films. The two vied with each other in the production of such films. Musashi first created a full-length animated film based on the Story of the Yearling while Kojiro followed suit by producing a film whose theme was centered on Tiny Black Sambo. During the process of producing the film, Musashi loses the sight of his eyes but his girl friend Otsu comes to his rescue and Musashi finally manages to complete the animated film on the Story of the Yearling which becomes more popular than the film produced by Kojiro. If the summary makes the story sound fairly simple, that’s because it is. Not necessarily in a bad way (I mean, it’s 130 pages), but overall what interested me most when reading the manga is seeing the way that Tezuka intertwines a whole mess of obvious and disparate references that end up being fairly central to the story, which otherwise is a fairly standard shonen hard work -> success story: the Miyamoto Musashi/Sasaki Kojiro rivalry, the history of animation, the life of Beethoven, and his own experiences, including what could be read as a foreshadowing of his future experiences in the world of animation. Oh, also this manga editor who reminds me of SSJ2 Carl Horn for some reason. If I were doing annotations or something on this manga, I’d probably elaborate on all of these, but I’m not, so I’m just going to talk about the ones that I find most interesting, specifically the stuff in here explicitly about animation. To begin with, there’s this graph, which shows up in the third chapter, which spends most of its time away from the action of the story in order to explain some basics of animation, like the phenomenon of persistence of vision, the phenakistoscope, and the animations of Emile Cohl. 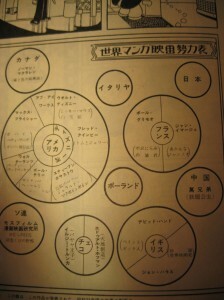 The graph was interesting to me because it shows that Tezuka is definitely familiar with the world of animation at the time, (for the katakana-challenged, some highlights: Norm Mclaren under Canada, Disney, Quimby, Bosustow, Terry, Lantz, Fleischer, Iwerks under America (I was hoping for some Harry Everett Smith myself), Trnka and Hoffmann(?) under Czech, and so on.) but he doesn’t seem to have much of an opinion on Japanese animation at the time, and doesn’t mention a single Japanese animator by name. In fact, just a few pages prior he mentions that domestic animated films (called manga eiga the whole work) never really took off in Japan. 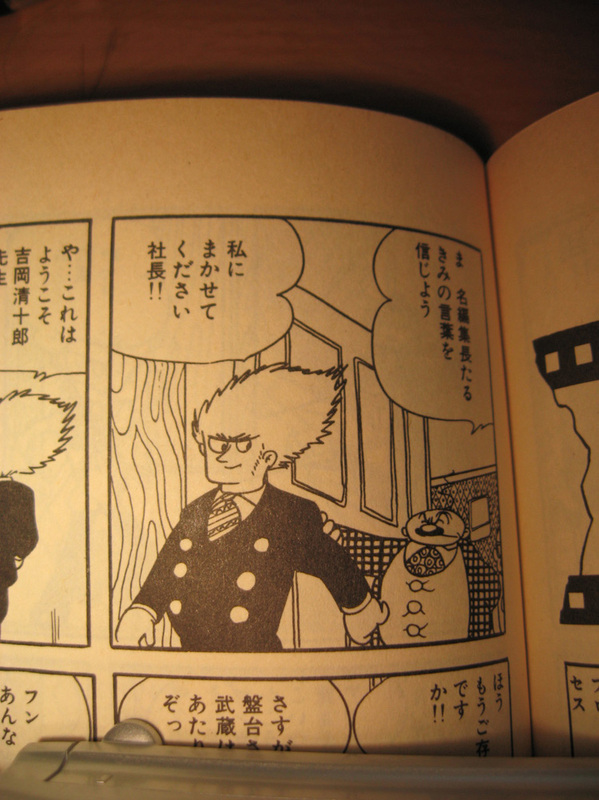 There’s also the matter of Musashi and the old, grumpy anime director that he meets, who seem to foreshadow a lot of Tezuka’s own career in animation. I’m going to warn you that it’s been a while since I’ve actually read a book about this, so please correct my horrible mistakes. 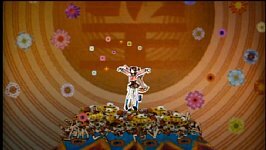 On one hand, there’s Musashi, who is young, talented, original, and able to produce drawings at an incredible speed, but there’s also the animation director who is constantly telling Musashi that the motion in his drawings is “dead”, and that, as the title of the work reminds us, film is alive. In sticking to this philosophy, the director ends up being ruined because he always goes over budget and can’t meet deadlines. I guess I won’t tell you how this problem is solved in the manga, only that it involves dream sequences and being in love with a horse from your home town. this is not what i wanted at all kadokawa!!!!!!!!!!!!! guess they’re too busy putting the final touches on Haruhi s2! 2chan.us is a blog. You can use a feed reader to receive updates on the entries or the comments. The design is called "design" and it is by Shii's Banana Hut. 0.559 seconds just for you.